petição: Put a Stop to Live Animals in Keychains and Mobile Phone Trinkets in China! Put a Stop to Live Animals in Keychains and Mobile Phone Trinkets in China! A sick trend is killing innocent animals in China. 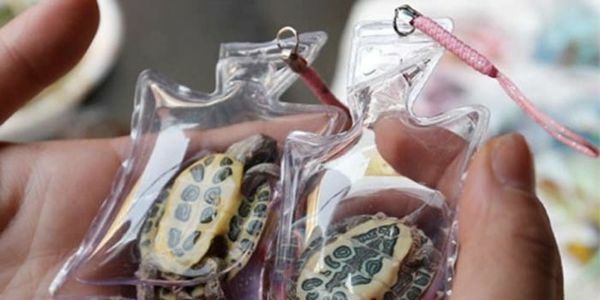 Vendors are sealing turtles, fish and small amphibious animals into plastic bags and selling them as keychain and mobile phone trinkets. The trinkets are supposed to bring good luck, but clearly bring only bad luck to the trapped animals. The animals can survive for days in the bag, but eventually suffocate or starve to death. Tell China to do more for animal welfare and to outlaw this sick practice! Sign the petition today! Thanks for all the Signatures - The Petition will be open for a good while - So keep Sign and Share - Thank you very much !